Update: Okay, as of today, 10/8/2013, HBO has released a working HBO Go app for Android 4.3. No Chromecast support, but it works. Okay, so, right after HBO fixed the HBO Go app to work with Android 4.2.2, out comes Android 4.3. And guess what? 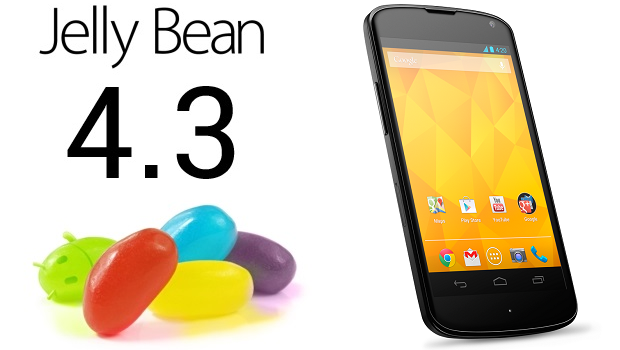 It’s listed as not supported in the Play Store for Android 4.3 devices. If you already had the app installed and then upgraded your device to 4.3, then the app either force closes or hangs when trying to run a video. The DirecTV app, which worked fine on 4.2.2, just hangs with a spinning circle when trying to start a video on 4.3. I’m sure both companies will get this sorted out, but for now it means I’m back to my iPad 3 for watching HBO video. The Starz app still works fine on Android 4.3, so I’m covered there. Just an FYI, in case you’re struggling to get either of these apps working on your freshly upgraded Android 4.3 device. Update: The DirecTV phone app received a recent update that now works on Android 4.3. So, that’s good news. Here’s hoping that HBO does the same sometime soon. Update 2: I tweeted HBO Go about this today (9/9/2013), and they responded. Typical, really, but at least they’re listening. Finally – someone else who has the same problem I do. It is my DirecTV app that isn’t working after the upgrade. I did call it in to them. Hopefully more people will call about it and they can update their apps. They fixed the directv problem as far as I know. IF, I had known that Directv and HBOGo apps did not work on 4.3, I would not have upgraded because even the Nexus 7 2013 shipped with less than 4.3, and upgraded after starting the first time. Can’t do HBOGO in the browser because Flash is not supported. Not Happy! I know, it’s a real bummer. I actually have to pull out my iPad to watch both. It’s ridiculous, there’s really no excuse. You would think that after one month, there would have been an update to make the damned program compatible with Android 4.3. With such a large subscriber base to keep happy, they would have done this BEFORE the release of 4.3. Can’t get HBO GO on my Roku either because of Directv, so they might want to change the name to HBO NO. Well it is now October first! 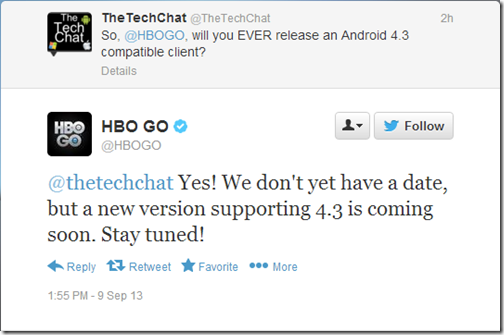 Still no HBO GO for Android 4.3. But wait, there’s more! Kit-Kat (4.4?) is going to be released soon. Will HBO with millions of viewers with Android tablets upgrade in time to be compatible with 4.3 only to fail in 4.4 or will they bypass 4.3 in favor of the upgrade 6.0 in a few years. Stay tuned boys and girls to see the next episode in the continuing saga of HBO NO. Guaranteed to bring dis-satisfaction to millions of viewers, guaranteed to be rememberered for years to come as an example of customer No Service. Yep, I was thinking the same thing myself the other day. 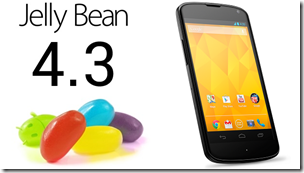 I have a feeling they’re skipping 4.3 and will release for 4.4 (including 4.3, of course). It’s the only thing that makes sense–not that it has to, of course. Fingers crossed.